2013 Ford Explorer MID SIZE CROSS OVER, FUEL EFFICICENT !! Trim:MID SIZE CROSS OVER, FUEL EFFICICENT !! 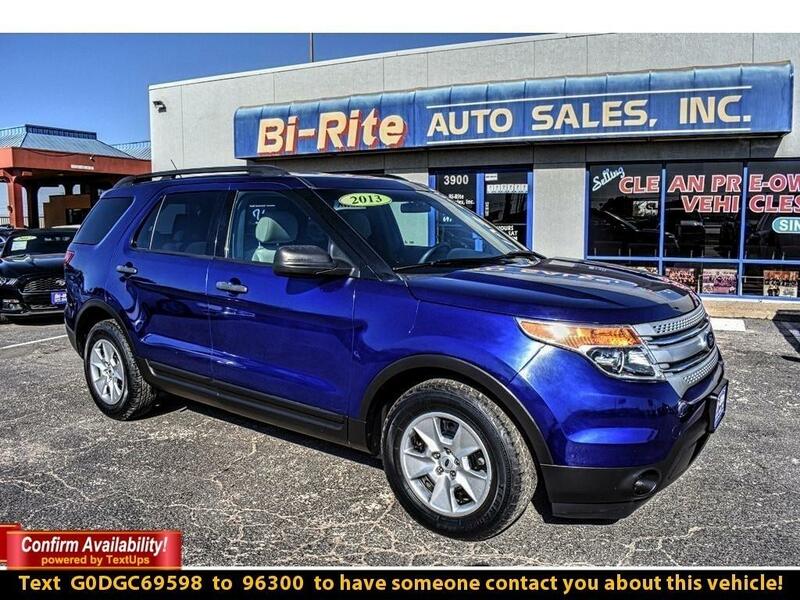 Our versatile 2013 Ford Explorer shown in Deep Impact Blue is eager to please you. Powered by a 3.5 Liter V6 that offers 290hp while tethered to a smooth shifting 6 Speed Automatic transmission. This Front Wheel Drive offers responsive steering and smooth handling along with near 24mpg on the highway. When it comes to style, the Explorer's upscale bold design is attractive and the spacious cabin is definitely a plus. Inside, the Explorer is loaded with remarkable features that begins with comfortable seating, high-tech instrument panel, six-speaker stereo system, CD/MP3 player with audio input jack, power windows, comfy seats and so much more! Our Explorer will fit your active lifestyle and don't forget the rear reclining seats so your family can enjoy the incredible ride! Ford Explorer earned top ratings in safety and it's easy to see why. Six standard airbags, SOS post-crash alert, Roll Stability control, and tire pressure monitoring are just a few of the features that keep you and your passengers safe. When it comes to a great versatile SUV with plenty of amenities you can't go wrong with the Ford Explorer. You have chosen well! Print this page and call us Now... We Know You Will Enjoy Your Test Drive Towards Ownership! Please call us for more information. Vehicle Inquiry for 2013 Ford Explorer MID SIZE CROSS OVER, FUEL EFFICICENT !! Trim: MID SIZE CROSS OVER, FUEL EFFICICENT ! !